The first time I saw Midnight In Paris, I was on a looong ANA Airlines flight to Guangzhou, China (with a layover in Tokyo, Japan). I had pretty much seen all of the films on the in-flight entertainment movie listings, & I was not all that enthused about this film, since I am not much of a Woody Allen fan (nor a fan of his work). so I decided to give this one a go…lest I pass out from sheer boredom. This film truly surprised me, because I liked it, really liked it. (Yes, Mikey. I really liked it.) I have pretty much fallen in love with the city of Paris all over again through this film. Watching this film makes me think of the animated movie Ratatouille: from the delicious, sumptuous food, to the grand architecture, & the overtly passionate love that emanates from every single pore. I know that the real Paris is nothing like how it’s portrayed in movies. The film industry always makes the city look less grittier & rigid, & always casts a soft rose-colored glow over this fair city of love. In Japan, there are tourism programs that the Japanese residents can take, which will give the visitors an orientation into what to expect when traveling to Paris. This orientation program for tourists provides a harsh dose of reality, pretty much a slap to the face, to help visitors face the fact that “Paris ain’t what you expect it to be from all the Audrey Hepburn movies you’ve been binge watching on Netflix.” So, I know that you’re not going to find women in flowy summer dresses riding vintage red bicycles with a basket on the front filled with fresh baguettes & a bottle of red wine. Nor will you find exquisitely dressed upper-crust ladies-who-lunch dripping in Chanel with their teacup terrier dogs perched neatly in their handbags roaming the couture lined streets. Paris is just like any other touristy city, except with better pastries. 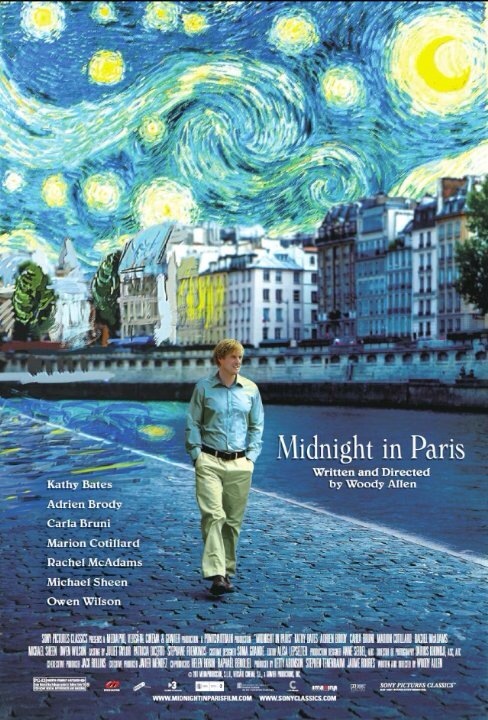 This movie, Midnight In Paris, really captivated me from beginning to end. At first, I was a bit surprised to find Owen Wilson cast as the main romantic lead actor. When I think of Owen Wilson, I usually think of a comedic, funny character, but he fit perfectly as the goofy, whimsical, charming character who, by walking the streets at midnight, paints a vivid love letter to Paris…his true love. I wasn’t all-too-excited about Rachel McAdams portrayal of Owen Wilson’s fiancée in the film. I didn’t really think that the two actors paired well or had any chemistry with each other. I know Rachel McAdams’ character was a woman who was not as excited about being in Paris as Owen Wilson’s character, but when she was acting unhappy in the film, it really showed. I mean, she truly looked like she didn’t want to be there (or in the film either). She just gave off that disinterested vibe throughout the entire film. However, that did not take away from the fun, lighthearted nature of the film…to be transported back in time to schmooze & confer with your literary & artistic colleagues of the “golden age”. Oh how incredible it would be to stumble upon a rickety taxi cab, only to be swept up in a frenzy to a party hosted by Scott & Zelda Fitzgerald!! That would surely be a riot! Not to mention having Gertrud Stein observe your scribbles only to give it praise & adoration. Or to strike up an intriguing relationship with the mistress of Pablo Picasso, & have your name wind up in a dime store novela. Seeing Owen Wilson’s character wander the streets of Paris late at night, listening to his narration of the city made me feel as though I was walking alongside him. The more I watched & listened, the more I yearned to visit Paris myself. I was imagining myself strolling along tree-lined streets & soaking up all of the sounds & aromas wafting in the air. Or lounging around in the park, after buying a warm baguette, some fromage & a basket of strawberries from the nearby market. Or browsing a vintage bookshop, hoping not to look out of place, & desperately trying to decipher the words on the covers of the books. Perhaps I would be sitting in a quaint café where nobody speaks any English (hilarious miscommunication ensues), sipping a small coffee & gazing at the passersby. 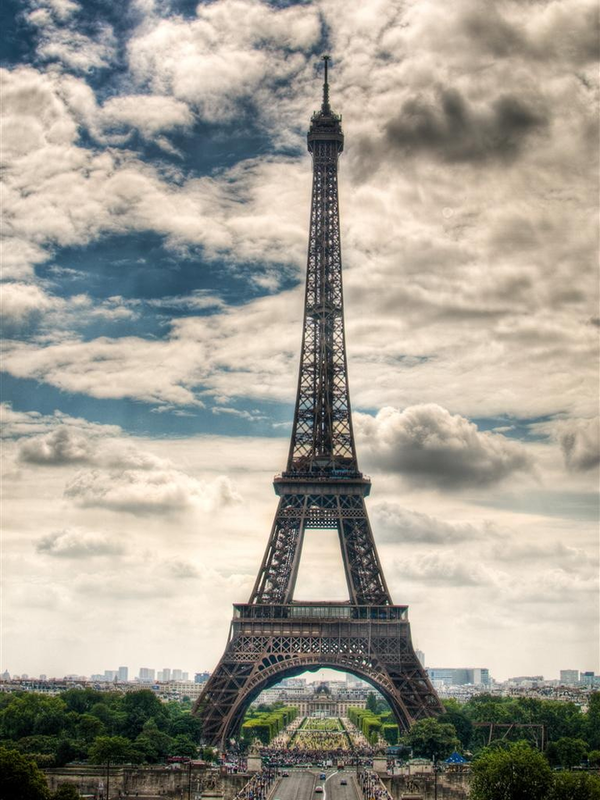 No matter the scenario, I would be over-the-moon just to be in Paris (for the first time in my life). I love the ending where Gil’s fiancée Inez is yelling at him to stop fantasizing, grow up, give up his dreams, blah, blah, blah. Gil quite casually brushes her off, calls off the wedding in the most spare-her-feelings kind of way, & announces that he’s going to move to Paris to become a true writer/artist (& not just some bohemian hippie). The best part is when Gil is walking along the river & runs into the girl from the vintage phonograph shop, & she tells him about how much fun it is to take a leisurely stroll in the rain. They happily walk off together chatting away as though they were long time friends. Alas, I leave you with a final parting photo of the Eiffel Tower…because this wouldn’t be complete without the iconic monument.